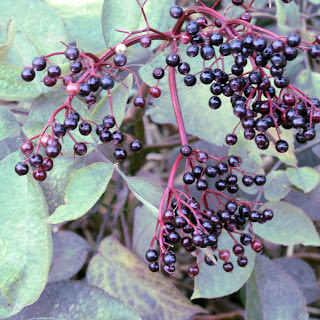 There are a great many elderberries around at the moment, beautiful, shiny and resplendent. It is said that the elderberry is the Englishman's grape, not only is the fruit used but also the flowers make flavoured drinks. The illustration above is taken from "An Illustrated Address Book" and shows a corner of the first garden my husband and I ever owned. I was reading on another blog, about dreams and the number seven; the house number was seventy seven which made the connection in my mind with painting. The garden was a typical terraced house garden, very long and narrow. At the end of garden was an allotment and tall elderberry bushes and hawthorn trees formed a hedge making the garden very private. A blackbird sang there in the evening, it was our little piece of heaven. I often dream that I am back in that house, the dream always follows the same pattern. I walk down the garden and discover outbuildings, rooms, extensions that I did not know I had. I make elaborate and exciting plans to transform these buildings into studios, guest rooms, potting sheds, all manner of things. I continue my journey down the garden and discover pathways, streams, ponds and lakes, sometimes I find the sea shore. When I wake I am always rather disappointed that these things do not actually exist, I could make such good use of all that space! I read somewhere that dreaming of rooms means unfulfilled potential, I have no idea what the water connection is, perhaps someone can enlighten me? The latest workshop that I attended was entitled “Finishing for the frightened” and they don’t come more frightened than me! Finishing in this instance, referred to gold tooling, a skill, which I am convinced, takes a lifetime to perfect. The tools, which we used, consisted of a wooden handle and a brass letter or pattern; using fillets or wheels to make linear patterns. 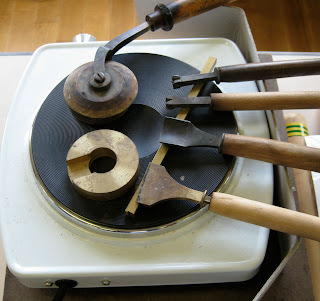 We started by heating the metal tools on a stove, this proved to be problem number one, if you don’t heat the tool enough it will not transfer the gold onto the book, if you heat it too much you can melt away too much of the adhesive and produce an ugly effect. By trial and error, much spitting (to judge the temperature) we had to decide when the tools were ready. In case you are wondering, a letter “I” will not retain as much heat as a letter “M”, because of the amount of metal used in the formation of the letter. By now I think you may be able to understand the complexities and variables involved. Our first practice was to try out the letter on fax paper, as this is heat sensitive you can get a good understanding of the amount of heat needed. When we had tried our hand at that we moved onto gold foil, which we used on pre prepared boards covered with book cloth. Gold foil is not actually gold, rather gold colour on an adhesive backing. The skill here is not only in ascertaining the correct temperature but applying the correct pressure and consistency of pressure over the area of each letter. Positioning the letters is also extremely difficult and something that I feel I would never master in a thousand lifetimes. 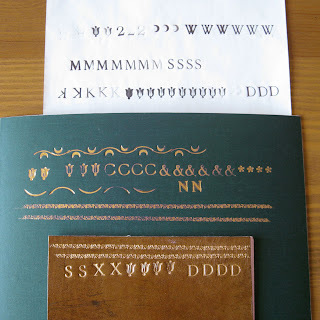 When we had made sufficient progress with the gold foil we moved onto real gold leaf and leather. Unlike the gold foil, the gold leaf needs to be adhered to a glare; (boards were covered with leather which had been treated with glare). These had prepared for us beforehand so it was one less thing to worry about. I won’t attempt to explain the complexities involved in handling gold leaf except to say that a mere breath can wisp it away, it is so delicate and light. It is also very beautiful and now I am aware of the difference between foil and leaf, infinitely prefer the real thing. I have posted my first feeble attempts for anyone who is interested. If nothing else they show how not to do it! 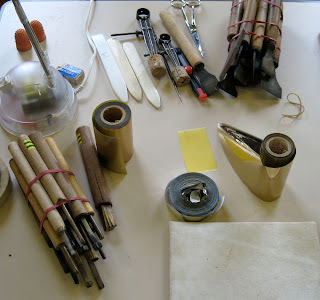 As always I enjoyed the day and learnt so much at the workshop, it gave me a much greater appreciation of the skills involved in fine binding. To see the image in more detail please click on the photograph. 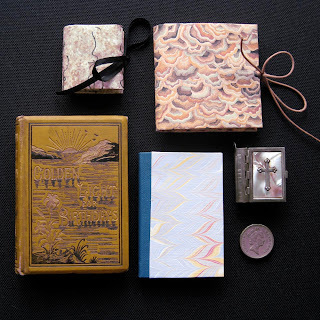 I have always had a fascination with miniature books and have, over the years, collected a fair few. I thought that you might like to see some of them. The first one I ever bought was the miniature bible, which is not much bigger than a one pound coin. I could, at the time of purchase, actually read the text, sadly now I have to use my magnifying glass. The birthday book is Victorian and contains selected biblical scripts for each day, I bought it because I had illustrated "A Book of Days" and was intrigued by this early example. A few years ago, I decided to learn bookbinding and book making so when I saw a miniature book making kit for sale, I had to have it! 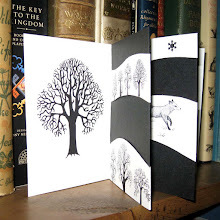 I ordered a kit from The Green Chair Press after falling in love with the Japanese paper and the origami nature of the book, which needs no glue, it is simply folded paper. 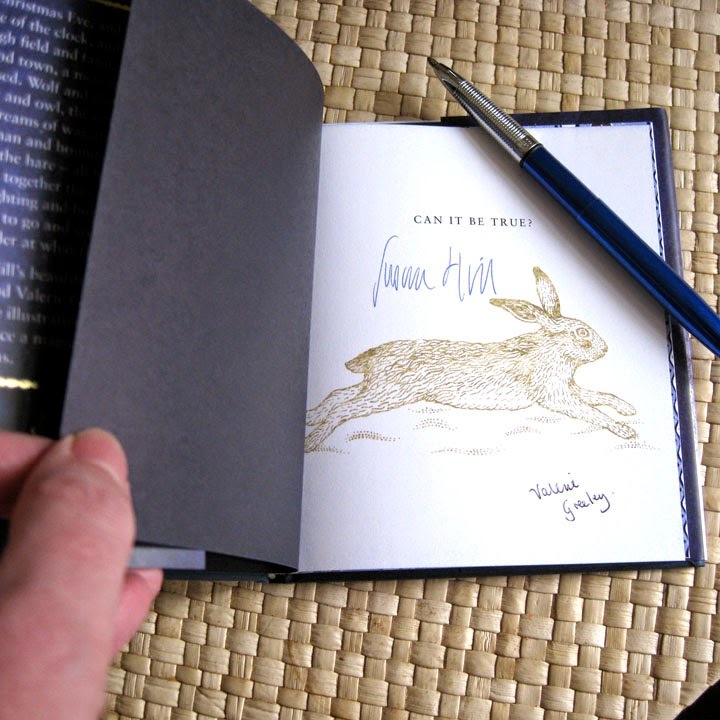 I was rather taken aback by the seemingly impossible task of transforming the tiny pieces of paper into a little book but after a little perseverance I managed to finish making the little book at the top left of the photograph. After that I was hooked and decided to print one of my designs onto paper and make a slightly larger version, (top right). The other little book is made from a piece of hand-marbled paper from yet another workshop, I shall save that story for another post. I think by now you will understand that I am something of a workshopaholic, sad but true. 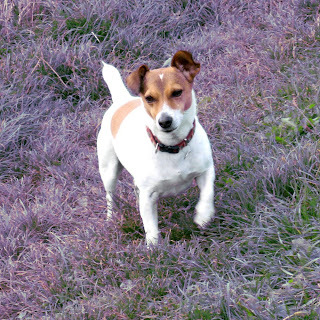 Kayla Coo, Karen and The Dutchess have all very kindly nominated me for various blog awards recently. I am afraid I have been very remiss at passing these awards on, to tell you the truth I find "the rules" hard to follow, it is difficult to choose favourites as there are so many great blogs to visit! So instead, I have decided to showcase some wonderful handmade items which have been made by extraordinarily gifted individuals. Each of these creatives has their own blog, if you are unfamiliar with their work you are in for a treat. If you click on the images you will be transported to their shops, but beware, you may stay longer than you think! Again, I hope that I have not left anyone out. 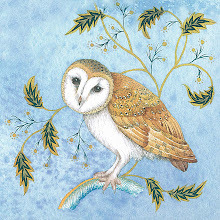 Karen Davis is an illustrator with her own blog called Moonlight and Hares. Morna's blog is called Bittersweet, she creates all kinds of things, using felted wools, she also makes fabulous dolls which I adore. Rima Staines makes individual clocks. she is also an expert printmaker, illustrator and book artist. PG at Middle of Nowhere illustrates children's books and creates wonderful characters using needle felt. Kayla Coo "paints with thread" and sews lovely things with felt and last but not least Celia Hart/ Magic Cochin is an illustrator and print maker and has a blog called purple podded peas. 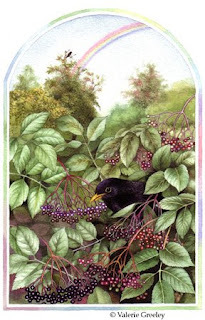 The illustration below is taken from my Hedgerow Collection. 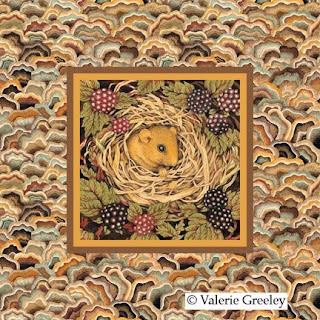 The pattern around the central dormouse square was inspired by fungi. Ted and I are making the most of the late afternoon daylight hours before the clocks change, it's so much nicer to walk in the sunshine! The hedgerows are full of berries, I love the way that each shiny berry reflects the light, making the hedges glow. Throughout my working life I have had to learn to store away reference material, it is inevitable that a Christmas commission has to be completed in mid summer and visa versa. How much more inspiring it would be to be able to paint in sync with the seasons. Now I have my digital camera it is possible to take hundreds of images and if I make a mistake, I can easily delete the image. I don't have to worry about wasting film anymore, so thank you to the brains behind the technology! There is a distinctly sultry feeling about today, a warm if not damp afternoon. 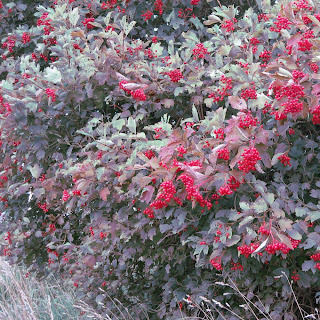 The lane were I walk my dog is full of hawthorn berries, bright red and abundant. 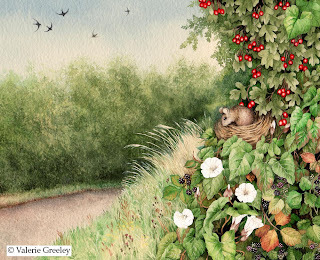 Bindweed climbs and clings, through the hedgerows and blackberries glisten like the tiny, beady eyes of a wood mouse. The painting below is from my children's book Down the Lane. The wood mouse is a figment of my imagination, he is sitting in an abandoned bird's nest. I did read somewhere that they sometimes make their nests in empty birds nests. Everything else is exactly the same down the lane today, except for the swifts and swallows who seem to have taken their leave. 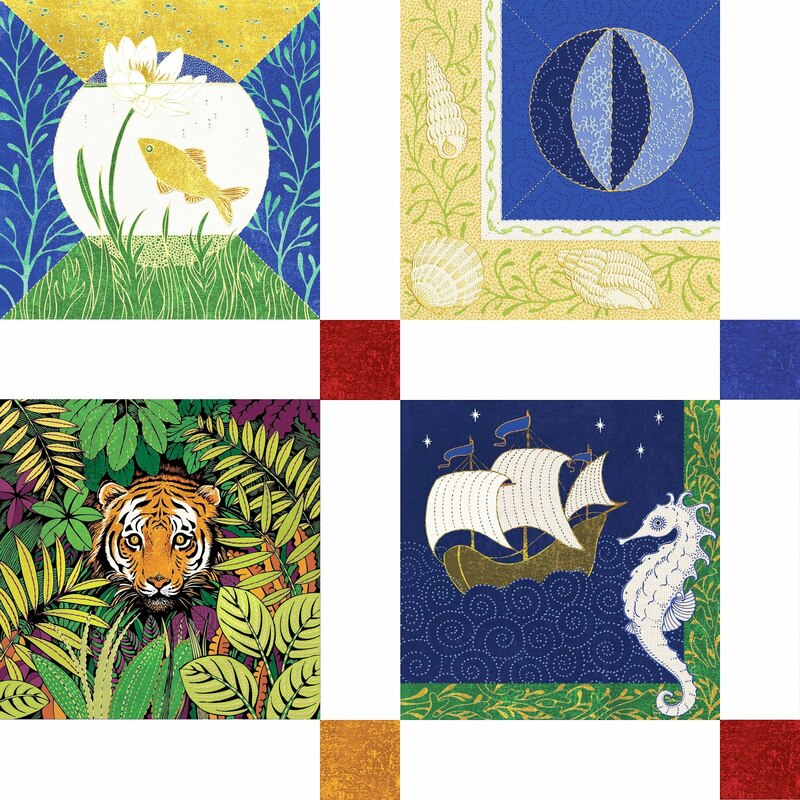 I am busy working on a new fabric collection for Makower UK, they manufacture fabrics for the quilters and crafters. Unfortunately, I am not allowed to show you what is on my desk right now as it is top secret! I did create a Hedgerow collection which is pretty much over now. The industry demands a rapid turnover of new designs, still, I mustn't grumble as it keeps the wolf from my door. I have seen a few fabrics on various websites but the warehouse at Makower in Henley-on-Thames has been out of stock for some time. If you, or anyone you know has made a quilt or sewn a project using any of my fabrics I would love to hear about it. 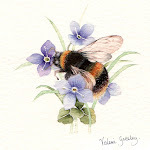 So far I have designed four collections; Nestled in Springtime, Hedgerow, Christmas teddies and Herb Garden. The later is about to be launched and I am waiting to see the strike offs. 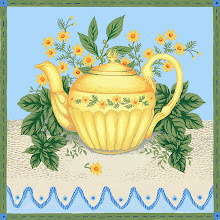 I thought it might be nice to show some needlework on this blog. I am the world's slowest quilter, despite having amassed a collection of printed samples. Here is the September piece from my Illuminations of Nature. If you click on the artwork you will see it in more detail. It was inspired by a piece of poetry by the American poet Danske Dandridge. Wild Spirit of the Fall! 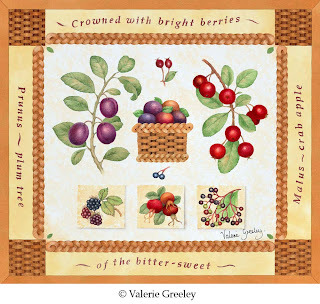 Crowned with berries of the bitter-sweet.